The Star wars series is by far the most important series to never spoil in a review, therefore making a review INCREDIBLY difficult to do. But, I’m also going to do my first ever spoiler talk on The Last Jedi! So let’s talk about the one thing everyone wants to know. Did I like it and was it good? Yes to both. It’s that simple. A lot of people I talked to have expressed their dissatification with this film and to me it was just because it wasn’t what anyone expected. Without spoiling anything I’ll say that many things we found to be important were revealed to be nothing. Some almost instantly. That’s not necessarily a bad thing though. The Star Wars saga has, in my opinion at least, become incredibly predictable. Seeing this new direction was incredibly refreshing… Now, the bad. There isn’t a lot of bad, but what was bad to me was huge. There is a whole subplot in this movie I found to be completely pointless and really took me out of it, just wanting to get back to the good parts. You’ll know it when you see it. Besides that I didn’t really agree with certain directions of characters. Other than that there’s not much I can say except overall I absolutely loved this movie. 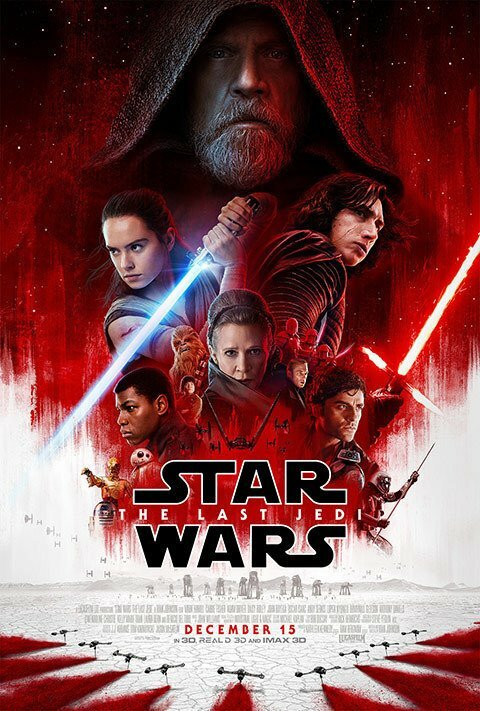 If I really think about it, the whole film is essentially a chase sequence and that just makes it more impressive… Ill go into greater depth in my spoiler article, but I can tell you right now its in my top three in the Star Wars saga.